I'm looking at an older 25' Whaler and the hatch covering the fuel tank has too much flex, is clearly rotten, and needs to be fixed. I tried the search function here but couldn't find much on it, but I'm not sure I'm using the proper search words. Is there a thread, or a place that you guys can point me to show how this is done? I have an idea, searched Youtube a bit, but need some more guidance as to what I may be getting myself into. 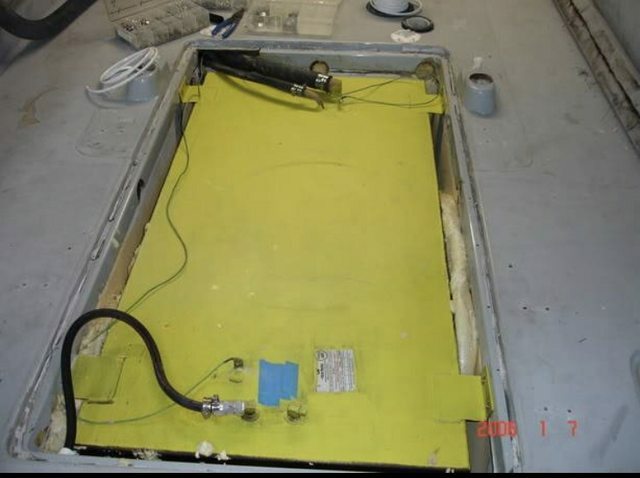 Sometimes referred to as "coffin cover" it is the flat rectangular cover that goes over the area where the fuel tank is located. I've never rebuilt one on a Whaler, but if someone can confirm the process is similar to other boats (such as Mako) I'd be happy to post up detailed pics of the repair process I used. Thanks [Phil]. I called a local marina with a very reputable fiberglass shop for a ballpark estimate to fix this, and they quoted $4,500. So, if I end up with the boat, I'll be doing the repair myself. If there had been a proper accounting of materials and labor--particularly for labor--I expect the cost of that repair would have easily been in the same range as the $4,500 estimate given by a commercial repairer cited above. Restoration of that deck section is often a big, ugly, messy job. Sometimes the checkbook is the best solution for those problems. But tackling that work can also be rewarding--just spend the saved $4,500 on something more fun. Note also that the old forum search can be used to search the entire contents of the website, if desired, by choosing that option in the search configuration. John_Madison CT wrote: Thanks [Phil]. I called a local marina with a very reputable fiberglass shop for a ballpark estimate to fix this, and they quoted $4,500! $4500..... That's crazy since the materials and labor are not even close to that figure. Attack it yourself, it's not difficult. 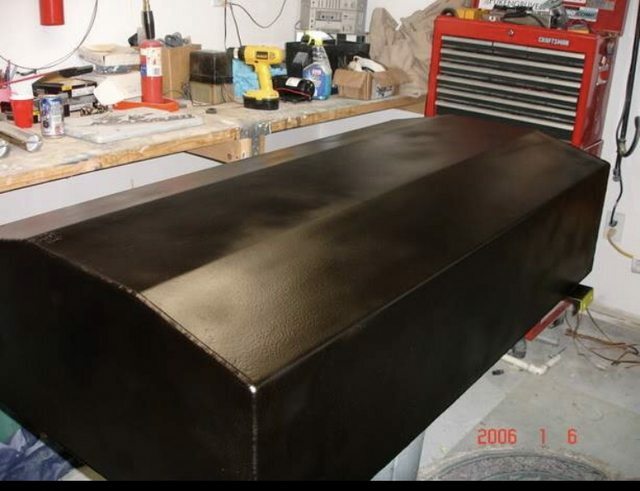 Here is the process on my coffin cover, not a Whaler, but process is the same. The inner skin came off easily and the core was badly rotted, so it was easy to remove with a scraper. Once the inner skin and core are removed the outer shell is not that strong, so make sure you support it. Make any repairs to the outer skin while it is exposed. 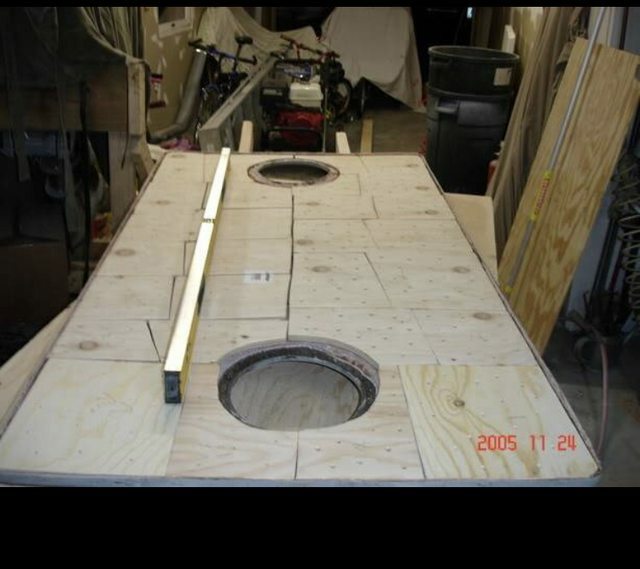 I filled in mounting holes from the previous owner (it was a Florida Marine Patrol Boat). Prep the surface with 24 grit to increase the surface energy of the bonds. I then cut and fitted a plywood core. I chose to cut the core into pieces to reduce the possible warpage when laminating. The core is not where the strength is, it separates the inner and outer skins where the forces are carried. I laid down glass and resin and set the core pieces in place and covered that with a release liner and lots of weight - batteries, paint cans, lead weights, anything that will maintain pressure so air is pressed from the outer skin and core. After curing, I roughed up the exposed core and prepped for glass and added several layers of fiberglass in the layup process. My coffin cover was stronger than when made, due to the extra layers of glass. Ready for primer and then Awlgrip. While in there it's always a good idea to pull and inspect the tank. I was lucky and the tank was still in great shape, but some fail earlier than others due to salt water corrosion. I decided to pull my tank and paint with zinc chromate primer and followed that with bedliner. Tank was installed and foamed into place. (top was not sprayed in bedliner since it's not in contact with foam. 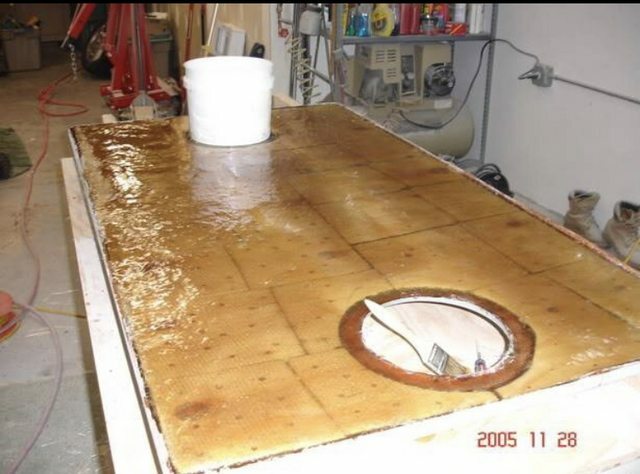 Whenever installing a tank, NEVER use rubber pads or strips since the carbon in the rubber can lead to early tank failure. Foaming the tank in is quick and easy with 2 part foam. I poured into the contained, covered and shook vigorously for 30 seconds and then poured and it worked great. Warmer temps or shaking too long could cause the reaction to create excess pressure in the container, so be careful. Tank installed, new hoses and grounding lines ready for more foam. Some insist in using epoxy, but it's not necessary. The bond strength of polyester resin is plenty strong. 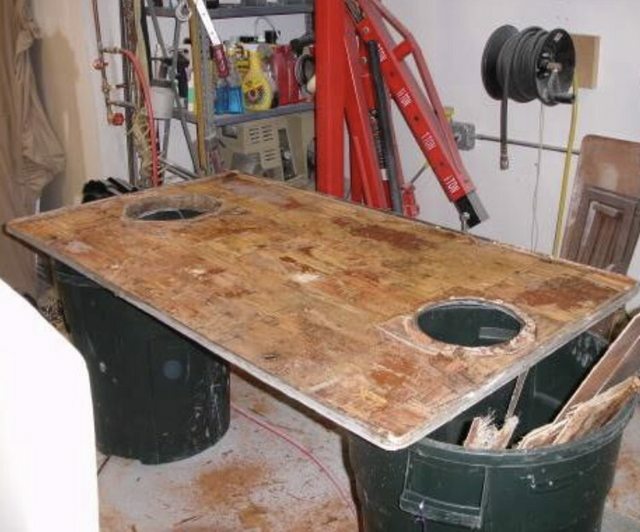 The cost of epoxy is far more and the cure times excessive. With polyester you can do multiple layups in an afternoon, where epoxy can take 3X or more time with the concern of amine blush that must be washed off. Looks like a great outcome. I'm facing a similar project although my fuel cover isn't in bad shape. The forward port corner does have some rot. I'm wondering if I epoxy that if it would be sufficient. The area is maybe 12 x 12. I could remove it but I have no experience with this kind of repair so a little concerned that I would have a well finished repair. Also, not sure how easy it would be to bond the one section to the rest of the core for the necessary strength. 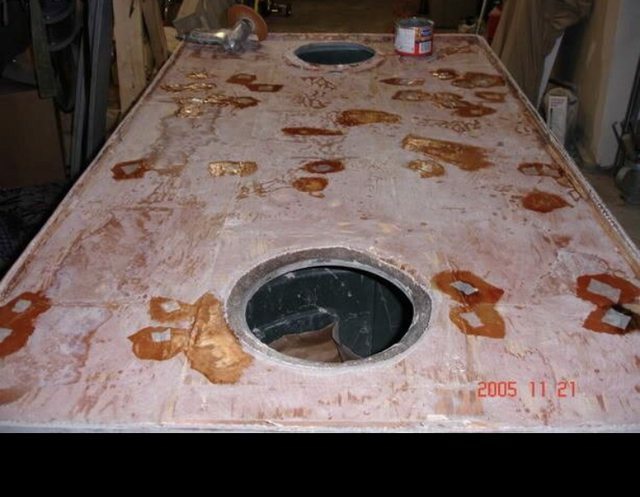 This particular section actually rests on a large section of the hull so it has plenty of support; hence my thought on an epoxy repair and not remove and replace.